A Cooperative Strategy for 21st Century Seapower represents an historical first. Never before have the maritime forces of the United States-the Navy, Marine Corps, and Coast Guard-come together to create a unified maritime strategy. This strategy stresses an approach that integrates seapower with other elements of national power, as well as those of our friends and allies. It describes how seapower will be applied around the world to protect our way of life, as we join with other like-minded nations to protect and sustain the global, inter-connected system through which we prosper. Our commitment to protecting the homeland and winning our Nation's wars is matched by a corresponding commitment to preventing war. Our citizens were involved in development of this strategy through a series of public forums known as the "Conversations with the Country." Three themes dominated these discussions: our people want us to remain strong; they want us to protect them and our homeland, and they want us to work with partners around the world to prevent war. These themes, coupled with rigorous academic research, analysis and debate, led to a comprehensive strategy designed to meet the expectations and needs of the American people. The security, prosperity, and vital interests of the United States are increasingly coupled to those of other nations. Our Nation's interests are best served by fostering a peaceful global system comprised of interdependent networks of trade, finance, information, law, people and governance. We prosper because of this system of exchange among nations, yet recognize it is vulnerable to a range of disruptions that can produce cascading and harmful effects far from their sources. Major power war, regional conflict, terrorism, lawlessness and natural disasters-all have the potential to threaten U.S. national security and world prosperity. The oceans connect the nations of the world, even those countries that are landlocked. Because the maritime domain-the world's oceans, seas, bays, estuaries, islands, coastal areas, littorals, and the airspace above them-supports 90% of the world's trade, it carries the lifeblood of a global system that links every country on earth. Covering three-quarters of the planet, the oceans make neighbors of people around the world. They enable us to help friends in need and to confront and defeat aggression far from our shores. We believe that preventing wars is as important as winning wars. There is a tension, however, between the requirements for continued peacetime engagement and maintaining proficiency in the critical skills necessary to fighting and winning in combat. Maritime forces must contribute to winning wars decisively while enhancing our ability to prevent war, win the long struggle against terrorist networks, positively influence events, and ease the impact of disasters. As it has always been, these critical tasks will be carried out by our people-the key to success in any military strategy. Accordingly, we will provide our people-our Sailors, Marines, and Coast Guardsmen-with the training, education and tools necessary to promote peace and prevail in conflict. Guided by the objectives articulated in the National Security Strategy, National Defense Strategy, National Military Strategy and the National Strategy for Maritime Security, the United States Navy, Marine Corps, and Coast Guard will act across the full range of military operations to secure the United States from direct attack; secure strategic access and retain global freedom of action; strengthen existing and emerging alliances and partnerships and establish favorable security conditions. that relies on free transit through increasingly urbanized littoral regions. Expansion of the global system has increased the prosperity of many nations. Yet their continued growth may create increasing competition for resources and capital with other economic powers, transnational corporations and international organizations. Heightened popular expectations and increased competition for resources, coupled with scarcity, may encourage nations to exert wider claims of sovereignty over greater expanses of ocean, waterways, and natural resources-potentially resulting in conflict. Technology is rapidly expanding marine activities such as energy development, resource extraction, and other commercial activity in and under the oceans. Climate change is gradually opening up the waters of the Arctic, not only to new resource development, but also to new shipping routes that may reshape the global transport system. While these developments offer opportunities for growth, they are potential sources of competition and conflict for access and natural resources. Globalization is also shaping human migration patterns, health, education, culture, and the conduct of conflict. Conflicts are increasingly characterized by a hybrid blend of traditional and irregular tactics, decentralized planning and execution, and non-state actors using both simple and sophisticated technologies in innovative ways. Weak or corrupt governments, growing dissatisfaction among the disenfranchised, religious extremism, ethnic nationalism, and changing demographics-often spurred on by the uneven and sometimes unwelcome advances of globalization-exacerbate tensions and are contributors to conflict. Concurrently, a rising number of transnational actors and rogue states, emboldened and enabled with unprecedented access to the global stage, can cause systemic disruptions in an effort to increase their power and influence. Their actions, often designed to purposely incite conflict between other parties, will complicate attempts to defuse and allay regional conflict. Proliferation of weapons technology and information has increased the capacity of nation-states and transnational actors to challenge maritime access, evade accountability for attacks, and manipulate public perception. Asymmetric use of technology will pose a range of threats to the United States and its partners. Even more worrisome, the appetite for nuclear and other weapons of mass destruction is growing among nations and non-state antagonists. At the same time, attacks on legal, financial, and cyber systems can be equally, if not more, disruptive than kinetic weapons. The vast majority of the world's population lives within a few hundred miles of the oceans. Social instability in increasingly crowded cities, many of which exist in already unstable parts of the world, has the potential to create significant disruptions. The effects of climate change may also amplify human suffering through catastrophic storms, loss of arable lands, and coastal flooding, could lead to loss of life, involuntary migration, social instability, and regional crises. Mass communications will highlight the drama of human suffering, and disadvantaged populations will be ever more painfully aware and less tolerant of their conditions. Extremist ideologies will become increasingly attractive to those in despair and bereft of opportunity. Criminal elements will also exploit this social instability. We will employ the global reach, persistent presence, and operational flexibility inherent in U.S. seapower to accomplish six key tasks, or strategic imperatives. Where tensions are high or where we wish to demonstrate to our friends and allies our commitment to security and stability, U.S. maritime forces will be characterized by regionally concentrated, forward-deployed task forces with the combat power to limit regional conflict, deter major power war, and should deterrence fail, win our Nation's wars as part of a joint or combined campaign. In addition, persistent, mission-tailored maritime forces will be globally distributed in order to contribute to homeland defense-in-depth, foster and sustain cooperative relationships with an expanding set of international partners, and prevent or mitigate disruptions and crises. Limit regional conflict with forward deployed, decisive maritime power. Today regional conflict has ramifications far beyond the area of conflict. Humanitarian crises, violence spreading across borders, pandemics, and the interruption of vital resources are all possible when regional crises erupt. While this strategy advocates a wide dispersal of networked maritime forces, we cannot be everywhere, and we cannot act to mitigate all regional conflict. Where conflict threatens the global system and our national interests, maritime forces will be ready to respond alongside other elements of national and multi-national power, to give political leaders a range of options for deterrence, escalation and de-escalation. Maritime forces that are persistently present and combat-ready provide the Nation's primary forcible entry option in an era of declining access, even as they provide the means for this Nation to respond quickly to other crises. Whether over the horizon or powerfully arrayed in plain sight, maritime forces can deter the ambitions of regional aggressors, assure friends and allies, gain and maintain access, and protect our citizens while working to sustain the global order. Critical to this notion is the maintenance of a powerful fleet-ships, aircraft, Marine forces, and shore-based fleet activities-capable of selectively controlling the seas, projecting power ashore, and protecting friendly forces and civilian populations from attack. Deter major power war. No other disruption is as potentially disastrous to global stability as war among major powers. Maintenance and extension of this Nation's comparative seapower advantage is a key component of deterring major power war. While war with another great power strikes many as improbable, the near-certainty of its ruinous effects demands that it be actively deterred using all elements of national power. The expeditionary character of maritime forces-our lethality, global reach, speed, endurance, ability to overcome barriers to access, and operational agility-provide the joint commander with a range of deterrent options. We will pursue an approach to deterrence that includes a credible and scalable ability to retaliate against aggressors conventionally, unconventionally, and with nuclear forces. Win our Nation's wars. In times of war, our ability to impose local sea control, overcome challenges to access, force entry, and project and sustain power ashore, makes our maritime forces an indispensable element of the joint or combined force. This expeditionary advantage must be maintained because it provides joint and combined force commanders with freedom of maneuver. Reinforced by a robust sealift capability that can concentrate and sustain forces, sea control and power projection enable extended campaigns ashore. The Sea Services will establish a persistent global presence using distributed forces that are organized by mission and comprised of integrated Navy, Marine Corps, and Coast Guard capabilities. This global distribution must extend beyond traditional deployment areas and reflect missions ranging from humanitarian operations to an increased emphasis on counter-terrorism and irregular warfare. Our maritime forces will be tailored to meet the unique and evolving requirements particular to each geographic region, often in conjunction with special operations forces and other interagency partners. In particular, this strategy recognizes the rising importance and need for increased peacetime activities in Africa and the Western Hemisphere. Contribute to homeland defense in depth. Maritime forces will defend the homeland by identifying and neutralizing threats as far from our shores as possible. From fostering critical relationships overseas, to screening ships bound for our ports, or rapidly responding to any threats approaching our coastline, our homeland defense effort will integrate across the maritime services, the joint force, the interagency community, our international partners and the private sector to provide the highest level of security possible. When directed, maritime forces will promptly support civil authorities in the event of an attack or natural disaster on our shores. Foster and sustain cooperative relationships with more international partners. Expanded cooperative relationships with other nations will contribute to the security and stability of the maritime domain for the benefit of all. Although our forces can surge when necessary to respond to crises, trust and cooperation cannot be surged. They must be built over time so that the strategic interests of the participants are continuously considered while mutual understanding and respect are promoted. A key to fostering such relationships is development of sufficient cultural, historical, and linguistic expertise among our Sailors, Marines and Coast Guardsmen to nurture effective interaction with diverse international partners. Building and reinvigorating these relationships through Theater Security Cooperation requires an increased focus on capacity-building, humanitarian assistance, regional frameworks for improving maritime governance, and cooperation in enforcing the rule of law in the maritime domain. Additionally, the Sea Services must become adept at forging international partnerships in coordination with the other U.S. services and government departments. To this end, the Global Maritime Partnerships initiative seeks a cooperative approach to maritime security, promoting the rule of law by countering piracy, terrorism, weapons proliferation, drug trafficking, and other illicit activities. Prevent or contain local disruptions before they impact the global system. Maritime forces will work with others to ensure an adequate level of security and awareness in the maritime domain. In doing so, transnational threats-terrorists and extremists; proliferators of weapons of mass destruction; pirates; traffickers in persons, drugs, and conventional weapons; and other criminals-will be constrained. By being there, forward deployed and engaged in mutually beneficial relationships with regional and global partners, maritime forces will promote frameworks that enhance security. When natural or manmade disasters strike, our maritime forces can provide humanitarian assistance and relief, joining with interagency and non-governmental partners. By participating routinely and predictably in cooperative activities, maritime forces will be postured to support other joint or combined forces to mitigate and localize disruptions. To successfully implement this strategy, the Sea Services must collectively expand the core capabilities of U.S. seapower to achieve a blend of peacetime engagement and major combat operations capabilities. Although the Sea Services conduct many missions, the following six capabilities comprise the core of U.S. maritime power and reflect an increase in emphasis on those activities that prevent war and build partnerships. Forward Presence. Maritime forces will be forward deployed, especially in an era of diverse threats to the homeland. Operating forward enables familiarity with the environment, as well as the personalities and behavior patterns of regional actors. Mindful of the sovereignty of other nations, this influence and understanding contributes to effective responses in the event of crisis. Should peacetime operations transition to war, maritime forces will have already developed the environmental and operational understanding and experience to quickly engage in combat operations. Forward presence also allows us to combat terrorism as far from our shores as possible. Where and when applicable, forwarddeployed maritime forces will isolate, capture, or destroy terrorists, their infrastructure, resources and sanctuaries, preferably in conjunction with coalition partners. Deterrence. Preventing war is preferable to fighting wars. Deterring aggression must be viewed in global, regional, and transnational terms via conventional, unconventional, and nuclear means. Effective Theater Security Cooperation activities are a form of extended deterrence, creating security and removing conditions for conflict. Maritime ballistic missile defense will enhance deterrence by providing an umbrella of protection to forward-deployed forces and friends and allies, while contributing to the larger architecture planned for defense of the United States. Our advantage in space-upon which much of our ability to operate in a networked, dispersed fashion depends-must be protected and extended. We will use forward based and forward deployed forces, space-based assets, sea-based strategic deterrence and other initiatives to deter those who wish us harm. Sea Control. The ability to operate freely at sea is one of the most important enablers of joint and interagency operations, and sea control requires capabilities in all aspects of the maritime domain, including space and cyberspace. There are many challenges to our ability to exercise sea control, perhaps none as significant as the growing number of nations operating submarines, both advanced diesel-electric and nuclear propelled. We will continue to hone the tactics, training and technologies needed to neutralize this threat. We will not permit conditions under which our maritime forces would be impeded from freedom of maneuver and freedom of access, nor will we permit an adversary to disrupt the global supply chain by attempting to block vital sea-lines of communication and commerce. We will be able to impose local sea control wherever necessary, ideally in concert with friends and allies, but by ourselves if we must. Power Projection. Our ability to overcome challenges to access and to project and sustain power ashore is the basis of our combat credibility. Our advantages will be sustained through properly sized forces, innovative technologies, understanding of adversary capabilities, adaptive joint planning processes and the proficiency and ingenuity of our Sailors, Marines, and Coast Guardsmen. We will maintain a robust strategic sealift capability to rapidly concentrate and sustain forces, and to enable joint and/or combined campaigns. This capability relies on the maintenance of a strong U.S. commercial maritime transportation industry and its critical intermodal assets. Maritime Security. The creation and maintenance of security at sea is essential to mitigating threats short of war, including piracy, terrorism, weapons proliferation, drug trafficking, and other illicit activities. Countering these irregular and transnational threats protects our homeland, enhances global stability, and secures freedom of navigation for the benefit of all nations. Our maritime forces enforce domestic and international law at sea through established protocols such as the Maritime Operational Threat Response Plan (MOTR). 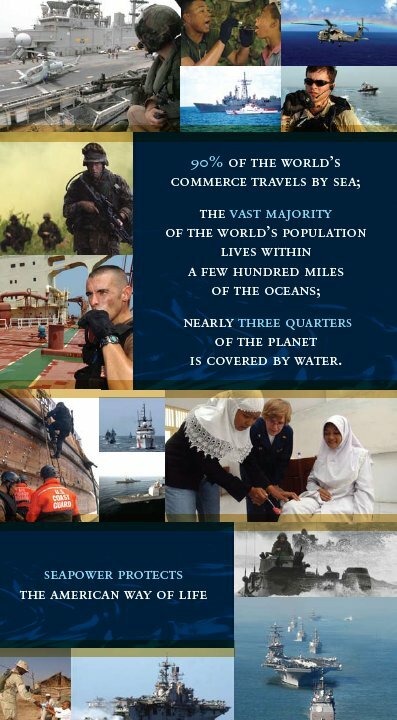 We also join navies and coast guards around the world to police the global commons and suppress common threats. Humanitarian Assistance and Disaster Response. Building on relationships forged in times of calm, we will continue to mitigate human suffering as the vanguard of interagency and multinational efforts, both in a deliberate, proactive fashion and in response to crises. Human suffering moves us to act, and the expeditionary character of maritime forces uniquely positions them to provide assistance. Our ability to conduct rapid and sustained non-combatant evacuation operations is critical to relieving the plight of our citizens and others when their safety is in jeopardy. Improve Integration and Interoperability. The combatant commanders' increased demand for mission-tailored force packages requires a more integrated approach to how maritime forces are employed. Marines will continue to be employed as air-ground task forces operating from amphibious ships to conduct a variety of missions, such as power projection, but they will also be employed as detachments aboard a wider variety of ships and cutters for maritime security missions. Sailors, Marines, and Coast Guardsmen, teamed in various combinations of security forces, mobile training teams, construction battalions, health services, law enforcement, and civil affairs units to conduct security cooperation and humanitarian assistance missions, illustrate adaptive force packaging. Homeland defense is the most obvious example of the requirement for greater integration. It is not sufficient to speak of homeland defense in terms of splitting the responsibilities and authorities between the Navy and the Coast Guard along some undefined geographic boundary. Rather, the Sea Services must-and will-work as one wherever they operate in order to defend the United States. Consistent with the National Fleet Policy, Coast Guard forces must be able to operate as part of a joint task force thousands of miles from our shores, and naval forces must be able to respond to operational tasking close to home when necessary to secure our Nation and support civil authorities. Integration and interoperability are key to success in these activities, particularly where diverse forces of varying capability and mission must work together seamlessly in support of defense, security, and humanitarian operations. Expanded cooperation with the maritime forces of other nations requires more interoperability with multinational partners possessing varying levels of technology. The Global Maritime Partnership initiative will serve as a catalyst for increased international interoperability in support of cooperative maritime security. Achieving the requisite level of integration and interoperability will demand a high degree of coordination among service headquarters staffs to fulfill their responsibilities of providing, training, and equipping forces. Furthermore, Navy and Marine Corps component commanders and Coast Guard functional commanders will play a central role in determining how maritime forces are organized, deployed, and employed. This role involves identification of combatant commander requirements and articulation of how their respective service capabilities can be integrated in innovative ways to meet those requirements. Close coordination among, if not outright integration of, maritime components may be required to do this effectively. At all echelons of command, we must enhance our ability to conduct integrated planning, execution, and assessment. Enhance Awareness. To be effective, there must be a significantly increased commitment to advance maritime domain awareness (MDA) and expand intelligence, surveillance and reconnaissance (ISR) capability and capacity. New partnerships with the world's maritime commercial interests and the maritime forces of participating nations will reduce the dangerous anonymity of sea borne transport of people and cargoes. Great strides have already been taken in that direction, and the National Strategy for Maritime Security has mandated an even higher level of interagency cooperation in pursuit of effective MDA. Maritime forces will contribute to enhance information sharing, underpinning and energizing our capability to neutralize threats to our Nation as far from our shores as possible. Critical to realizing the benefits of increased awareness is our ability to protect information from compromise through robust information assurance measures. Such measures will increase international partner confidence that information provided will be shared only with those entities for which it is intended. Prepare Our People. Given the distributed nature of the forces executing this strategy, we must properly prepare Sailors, Marines, and Coast Guardsmen for the challenges and opportunities ahead. We are creating a dispersed force under decentralized authority in a world of rapid information exchange. Maritime forces will normally operate in a less concentrated manner than they do today, and junior leaders will be entrusted with a higher level of responsibility and authority for carrying out important aspects of strategically important missions. Junior personnel will be required to interact with a far greater variety of U.S. and multinational partners and indigenous populations than their predecessors. Professional development and unit training must be refined accordingly. Operations as an integrated team require improved mutual understanding of respective service or agency capabilities and cultures, which can be achieved through expanded interagency teaming of students and instructors throughout training, education, and staff assignments. Similarly, if we are to successfully partner with the international community, we must improve regional and cultural expertise through expanded training, education, and exchange initiatives. Significantly, this strategy requires new ways of thinking-about both empowering individual commanders and understanding the net effects of dispersed operations. Such operations require a broadly shared responsibility among: the on-scene commander responsible for ensuring actions are in accordance with the commander's intent; the higher commander responsible for providing intent and guidance to subordinates; the parent service of dispersed forces responsible for ensuring that units are trained, equipped, and culturally prepared for the missions they will undertake; and, finally, the regional commanders responsible for determining appropriate force levels and readiness postures. This strategy is derived from a thorough assessment of the Nation's security requirements. It does not presume conflict but instead acknowledges the historical fact that peace does not preserve itself. Looking across the wide maritime domain, it calls for a broad portfolio of core capabilities to support our vital interests, realized by well-trained, highly motivated and ably-led people. The strategy focuses on opportunities-not threats; on optimism-not fear; and on confidence-not doubt. It recognizes the challenges imposed by the uncertain conditions in a time of rapid change and makes the case for the necessity of U.S. seapower in the 21st Century. 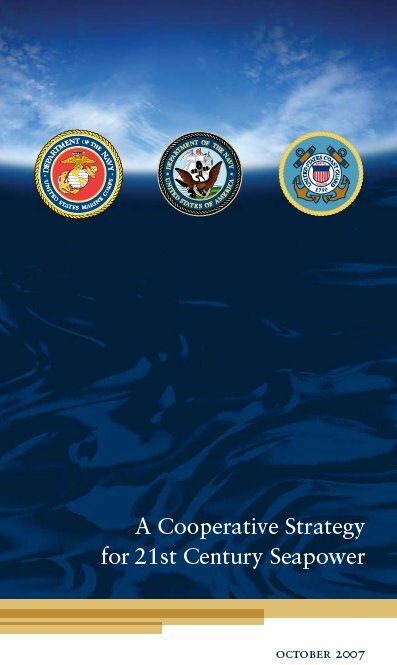 As a declaratory strategy, this document challenges the Sea Services to evolve an expanded range of integrated capabilities to achieve enduring national strategic objectives. 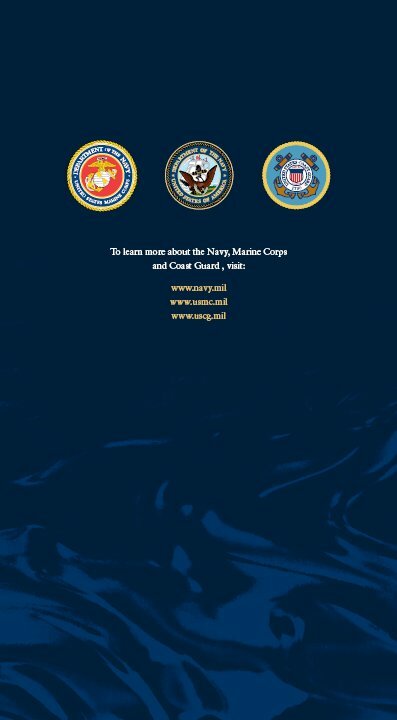 Further experimentation, operational experience, and analysis are necessary, as is sea service commitment to building upon the ideas that this document puts forward. However, the Sea Services cannot do this alone. The diverse elements of the greater maritime community must be inspired and supported as they invest to secure peace and prosperity across the maritime domain. The Sea Services commit to continuing the process of collaborative strategy implementation in the years ahead. 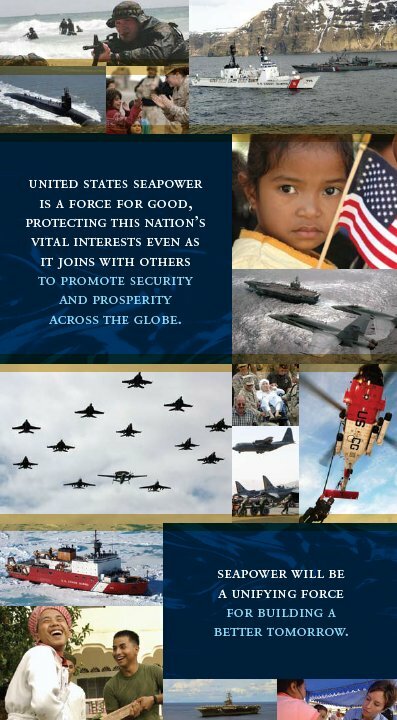 United States seapower is a force for good, protecting this Nation's vital interests even as it joins with others to promote security and prosperity across the globe.